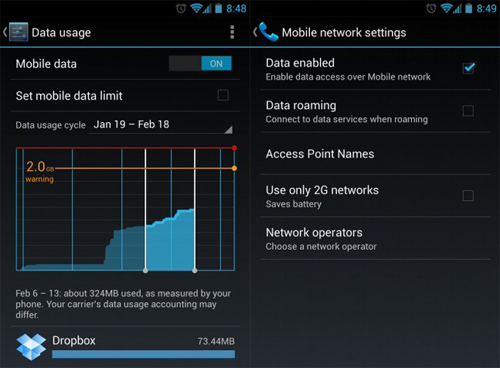 If your like me you probably don't need to manage your mobile data. But not everyone is on a 6GB data plan. So today we will teach you what you can do to limit the accidental "Oh my god I'm over my data limit". This will help you not incur additional charges. Within your Android smartphone you have the ability to control and see your usage for mobile data as well as the ability to cap it. What will happen is it will reach the 2.7 and give you a warning. Then when it hits 3 it will shut off data completely. If you want to still use data (say if you have a flex plan that will bump you up and you're okay with paying the extra) just don't check the 'set limit' and move only the orange line. This will let you go higher, but will still just warn you at the orange line. Bonus: You can also click any of the apps that are using up the data and see how much data it's using FOREGROUND (i.e. while you have it in use) and BACKGROUND (i.e. while it's just running in the background). What's nice is that you can then choose to 'restrict background data'... so it'll only get data while you have the app open. Now on some other devices/rom this might be located at other places. But either way this will allow you to make sure that you never go over or at least give you a better understanding of what's going on with your app usage.